As a welcome change from my normal writing and research I have often celebrated the tradition of digging out the model trains of various vintage after Thanksgiving for the Christmas season in various articles and images. Last year I highlighted an icon of the 20th Century: The Lionel Company. I grew up with my father's Lionel trains, loving the idea of these rugged three-railed trains, the smell of ozone and smoke pellets, the automated accessories, the die cast metal, but in reality the noise of those things scared the hell out of me! Today I get to share these trains as well as other scale models I've collected over the years with my children. The trains of the Lionel era represented a period of craftsmanship, ingenuity and excitement, where life was simpler and toys didn't compete with electronic devices. Still today I relish in the fact that every year when the trains come out there is that renewed interest when the kids put down the game remote or Ipod to run the trains under the tree. I wanted to take some time to share more imagery from the great Lionel and repost last year's story of the great company that was largely responsible for encouraging a holiday tradition that continues, spanning many generations. The ubiquitous orange and blue box that every Lionel Product was packed in. This is one of the few I have left that have held together over 60+ years from when my father had the trains as a boy. With modest beginnings Joshua Lionel Cowen and Harry C. Grant founded the Lionel Corporation in 1900, building model trains for retail window displays to help draw consumers to their stores. In 1906 the company responded to the increasing demand for the electric trains in the consumer market and developed its trademark three-rail “standard gage” track to simplify wiring and use of accessories. By 1915 Lionel would supplement the large standard gage with the budget minded O scale which would later become the standard size of their product lines. Lionel’s use of sharp advertising was ultimately responsible for tying model trains to Christmas, making them popular presents during the holidays, establishing traditions that survive today. By WWI Lionel was one of three major US manufactures of toy trains, surpassing competitor Ives as the market leader by the 1920’s. Lionel’s growth and aggressive ad campaigns further led to Ives' bankruptcy in 1928. Like many other companies, the Great Depression would be a severe detriment to Lionel’s business, as a result their 1927 operating profit of over $500,000 plummeted to $82,000 in 1930, and ultimately a loss in 1931 of over $200,000 putting Lionel into receivership by May of 1934. A product credited with saving Lionel during the Depression era was a wind up hand car featuring Mickey and Minnie Mouse which Lionel sold well over 250,00 units providing the cash flow to keep the company from closing. In 1942 Lionel ceased toy production to produce items for the United States Navy during World War II. Regardless of the lack of toy train production, the advertising department pushed heavily to urge American teenagers to start planning their post-war layouts. By late 1945 Lionel resumed production, replacing their original product lines with more realistic trains and accessories exclusively in O Scale. 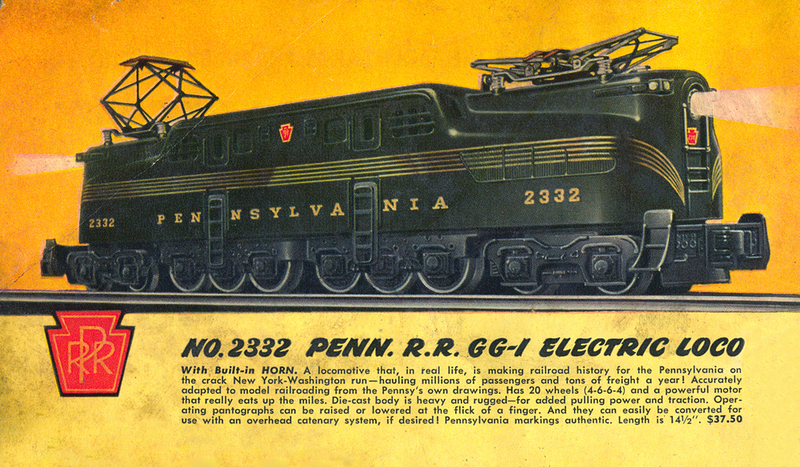 Considered by many aficionados as the golden years, 1946-1956 saw sales soaring with new items including the famous Santa Fe Warbonnet EMD F3 locomotives as well as the Pennsylvania Railroad GGI and experimental S2 steam turbine locomotive. During the 1950s Lionel would tout its short-lived title of largest toy manufacturer, out selling American Flyer almost 2:1. After 1955 sales declined steadily with the rising popularity of the smaller but more realistic HO Scale and to many the end of the true “Lionel era” was in 1959. Over the years Lionel was diversified unsuccessfully and the name survived in different ways including retail toy outlet Lionel Kiddy City. Today the Lionel name remains the most famous name in model trains, though not associated with the original corporation, Lionel LLC owns most of the product rights and trademarks continuing the legacy started by American businessmen Joshua Lionel and Harry Grant well over 100 years ago. Author's note: Growing up we set up my father's Lionel Trains the weekend following Thanksgiving in a spare bedroom, where I would spend most of my time for the next month and half. In the early 1980's (1982?) I had a second layout at my grandparents house that stayed up almost year round in the downstairs rec-room. 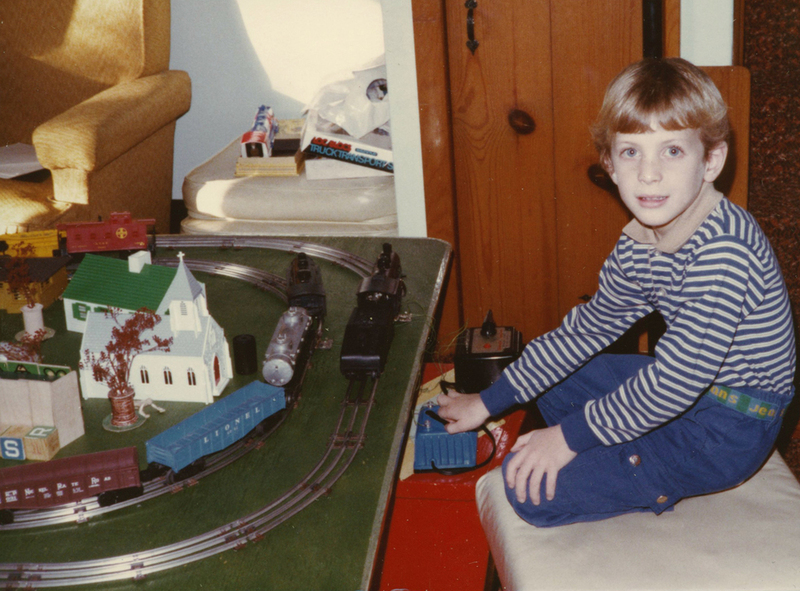 Here is me at the throttle of this layout in a photo dated 1983, I was 7 years old. These experiences were what shaped my imagination and sparked my curiosity of the railroad, both in model and prototype form. The Lionel catalog images are from several originals that were passed on to me through various family members. They still bring about that nostalgic feeling of excitement that came on Saturday morning when we would bring all the Lionel boxes down from the attic, after which my grandfather, father, brother and I would work together to build the train layout.